No matter where in the country you happen to live, fleas are working overtime to bite your cat, and trying to infest your home. 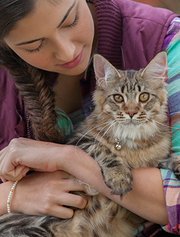 Vectra® for Cats and Kittens is a once-a-month topical treatment for use on cats against all flea life stages (eggs, larvae, pupae and adult fleas). Fast-acting – kills fleas in 6 hours. Kills by contact, fleas do not have to bite. Kills fleas that may transmit disease, including bartonellosis, tapeworm and tularemia. Kills fleas that may cause flea allergy dermatitis (FAD) and anemia. Controls development of all flea stages for 1 month. Controls and stops flea infestation and prevents re-infestation. Can be used on cats as young as 8 weeks of age. Convenient topical treatment with patented applicator.